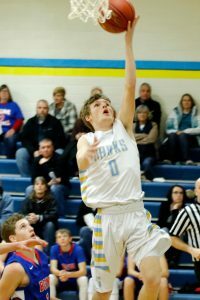 The Lynnville-Sully boys remain undefeated in the SICL Conference after facing BGM and Keota in the past week. Senior Brevin Hansen lays up a shot in last Tuesday’s game against BGM. He finished the night with 16 points as the Hawks’ No. 2 scorer. L-S won the game over BGM, 77-41. When the BGM Bears visited Sully on Tuesday, Dec. 12, they came into the game with a 1-3 record, looking to upset the Hawks on the their home court. The Hawks put those hopes away quickly as they jumped out to a 22-2 lead in the first quarter. The L-S boys rolled with that momentum the rest of the night and won the game 77-41. The Hawks shot 50 percent from the field on 25-of-50 shooting. The leading scorer on the night was senior Jesse Van Wyk with 17 points, eight of them coming from the free-throw line. Fellow senior Brevin Hansen contributed 16 points, shooting 7-of-10 from the field. The rest of the scoring was balanced out with five players scoring between five and eight points. The Hawks dominated the boards, beating the Bears 43-27 in the rebounding category. Leading the Hawks in rebounds were senior Corey McCoy and junior Gage Vander Leest with six apiece. Others contributing with rebounding were Van Wyk and juniors Grant Wehrle and Rylan James; all three of them grabbed five boards. The Bears were led by sophomore Noah Beck with 11 points and three steals. The leading rebounder for the Bears was sophomore Jordan Kriegel with five rebounds. Senior Jesse Van Wyk denies a shot by Keota’s Hunter Wilson. Van Wyk blocked three shots in the game, and the Hawks’ height played a big role in the 79-50 win. 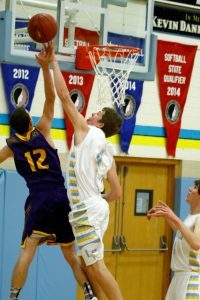 Hosting the Keota Eagles last Friday, Dec. 15, L-S dominated the whole game and won 79-50 by getting out to a good lead and never looking back. In the first quarter, the Hawks were able to get easy layups off offensive rebounds. They played good defense against the Eagles and forced them to commit four turnovers. The Hawks scored 22 points compared to 10 points for the Eagles. In the second quarter, L-S kept up the defensive intensity, only allowing eight points while scoring 21. The Hawks were physically too big for the Eagles, blocking many shots in the paint. In the second half, the scoring was almost even. Offensively, the Hawks slowed the pace down because of the big lead they had. The Eagles were able to get easier baskets, but the Hawks already had a big lead. “We were able to get many offensive rebounds and putbacks. They had two good players that we were able to shut down. Our length caused them major problems on both ends that they didn’t have an answer for,” said junior Rylan James. The Hawks were led by two players with double-doubles. James had 24 points and 15 rebounds, and senior Jesse Van Wyk contributed 24 points and 10 rebounds. The Hawks were able to make 16 of 22 free throws during the game, 10 of which came from Van Wyk, who shot 10-of-12 from the line. L-S made five of 19 shots from beyond the arc. Senior Brevin Hansen connected on three threes during the game. The major difference in the game was the Hawks were able to get 16 offensive rebounds. The Eagles were led by senior Luke Greiner with 14 points and senior Hunter Wilson with 11. The Eagles shot 15 of 50 from the field, eight of which came from behind the arc. The Eagles only had two assists on the night and 26 rebounds. The Hawks improve to 6-1 and look to continue their four-game win streak with two games left before Christmas break.